Screens: A massive 200+ foot long Ultra HD screen and dozens of other HD screens for sports, including horse racing. The Westgate “SuperBook” is just that – a Super Sports Book, boasting the largest floor area of any sports book in the world and massive ultra HD screens. And if that were not enough, the massive Westgate Theater hosts “Football Central” on NFL Sundays and March Madness parties where you can catch all of the action on massive jumbo screens while enjoying the theater ambiance and surround sound speaker system….a sports bettor’s paradise. Race and Sports Book Director Jay Kornegay and his team do an outstanding job catering to both locals and those visiting Vegas from out of town. 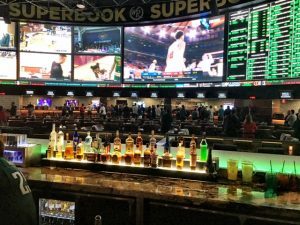 They are one of the first Las Vegas properties to post weekly NFL lines (Sundays at 4pm) and the array of parlay cards and proposition bets that the SuperBook offers is some of the best amongst Las Vegas Sports Books. Their season-long Super Contest is also very popular amongst sports bettors with big payoffs for the top against the spread NFL bettors. Drinks are free as long as you are betting on horse racing or sports. Once you place your bet, you will receive a free drink ticket or tickets. How many depends on multiple factors but if you are betting more than $50 and you tip, you will generally be in good shape. Make sure to ask politely. Your mileage may vary depending on the ticket writer but the majority are pretty good about throwing a drink ticket or two and maybe more your way. Be patient on big sports days as the Super Book is a popular place amongst sports bettors and demand for cocktail service is high. 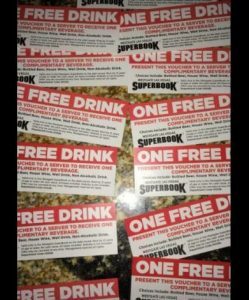 The bar to the rear of the SuperBook will accept your drink tickets. If you prefer to purchase your refreshments, there are $3 food and drink/beer specials during the Football Central parties on Sundays and other beer specials at the rear of the SuperBook. As far as food options go, cheap eats are available during the Football Central parties in the theater. The Superbook Food Court was upgraded about a year ago. The multiple food offerings are the usual…well, sports bar food (burgers, hot dogs, pizza, sandwiches, etc.). But you don’t come to the Westgate SuperBook for the food. For the ultimate Vegas Sports Book experience, the Westgate SuperBook is a must stop while in town. 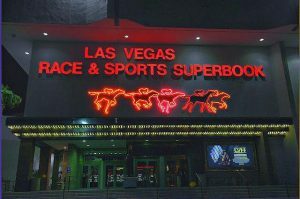 Parking – The Super Book offers the most convenient parking set up of any Las Vegas Sports Book. There is a parking area to the rear of The Westgate, which is directly adjacent to the SuperBook entrance off of Joe Brown Road. It doesn’t get any easier than this for access to the sports book. If you are choosing to go vehicle free, there is a monorail stop at the Westgate that also adds to the convenience of getting to this off-strip property. 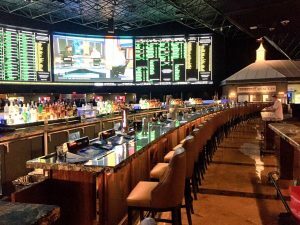 The Sports Book Bar – This is arguably the best Video Poker bar to watch a sporting event in all of Vegas (sorry LongBar). The vantage point from the barstools are just about perfect to view the SuperBook’s big screens. There is also a long counter just behind the seating area with outlets for smart phones and other portable devices – very convenient. Smoking – Smoking is prohibited in the sports book area, however the Clubhouse is a separate, enclosed room connected to the sports book. 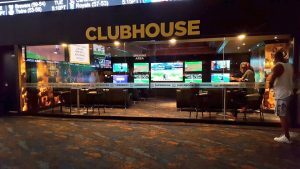 The Clubhouse has multiple HD screens and permits cigarette and cigar smoking – something that is hard to find at Vegas sports books nowadays. And as is to be expected, the smoke can get pretty thick in this space. Waiting in Line – Lines to place a wager can get long on busy sports days so plan accordingly. The SuperBook has an app that you can use while in Nevada that is super convenient. If you plan to make a sports bet during Super Bowl weekend or March Madness, plan accordingly as the queue can get excessively long with wait times ranging from 30 minutes to over an hour. The Westgate Super Book is one of the best, and certainly the biggest, sports books in the world. If you’re in Vegas, it’s worth checking out.